Uncover family legacies of evil in Stephanie Lenz's "Inheritance" and Maurice Broaddus' "Trouble Among the Yearlings." Walk the surreal nightmare of alien control in Earl P. Dean's "Hiding Mountain: Our Future in Apples." Twelve stories of coal-black shadow from authors intimately familiar with the region are waiting to take you to the depths of the earth and into the darkness of the human soul. 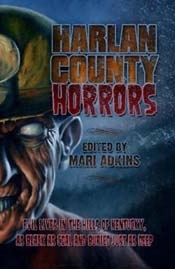 "Harlan County Horrors is a jaunty return ride to the land of scary rednecks." "It's been a while since I've read an anthology as good as Harlan County Horrors. Throughout the project, Harlan County maintains her individuality while the authors offer varying plots and characters that define her people, mountains, and valleys. All the while, Mari Adkins does a great job as tour guide, ensuring a bushel of great old-fashioned storytelling, Appalachian folklore, and well-developed characters. I had a hankerin' for a chaw of tobacco the whole time I read it." "Harlan County Horrors is a breathtaking thrill ride into the nightmarish backwoods of America's Heartland. Visceral and imaginative, Mari Adkins invites you into the darkest recesses of the Appalachian landscape, navigating through the malefic folklore of a timeless place where the roots of horror run deep." "A delightful romp through the backwoods of hillbilly horror." "The authors of Harlan County Horrors take us not only through the cold, black depths of coal mines, but into an equally dark, mystical core and its effects on humanity. Mari Adkins sends us on a runaway cart through the past, present, and future of a land not meant to be trespassed, let alone punctured miles deep. If you thought the best thing about Kentucky was its fried chicken, I dare you to cross the county line with this book as your guide." This title was added to our catalog on October 11, 2009.